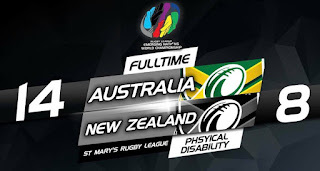 Australia and New Zealand were locked at 1 win a piece in the Physical Disability Championship, both sides were hoping to grab the series today at St Mary’s Stadium. Australia had early field position in New Zealand’s danger zone but a kick that went a little too long over the dead ball line would stop any momentum Australia had. New Zealand winger Phil Milne made himself known to the Australian defence making some good metres down the sideline before helped off the field to an injury after a tough tackle from the Australian prop Ed Sharp. In the 10th minute we had our first try to Australia through centre Daniel Frost who finished off a nice backline move and showed a lot of pace burning a couple of New Zealand defenders and to add insult to injury he improved his position under the posts and so he was able to convert the goal to give his side a handy 6-0 lead. Australia’s halfback Mitch Gleeson looked for a couple of opportunities to score but the New Zealand defence were able to keep him out. Gallant Australian defence in the 23rd minute shut down a Mew Zealand attacking raid. With the first half siren sounding Australia went into the sheds with a 6-0 lead. New Zealand hit back quick to open the second half with Phil Milne returning onto the field being cleared from injury and scoring a well deserved try in the corner. Michael Kulene couldn’t convert from the sideline and scored remained in Australia’s favour 6-4. In the set after points Australia would get one back with their halfback seeing New Zealand were short defenders down the sideline and hustled the ball to Daniel Frost who raced away and scored in the corner. His own conversion was unsuccessful and Australia lead 10-4. Off the back of a big charge the Kiwi prop Jay Gilmour was injured in a tackle and was escorted off the field but not before some banter between himself and Australia’s Ed Sharp. Che Formusek scored for the Kiwis in the 40th minute right in the corner but unfortunately Kulene couldn’t convert but Australia held a narrow 10-8 lead. It was Australia hitting back again in the very next set and the hattrick was completed as Daniel Frost crashed of the line off the back of a nice dummy half run down the short side. Frost was unable to add the extras and Australia lead with 7 minutes to go 14-8. 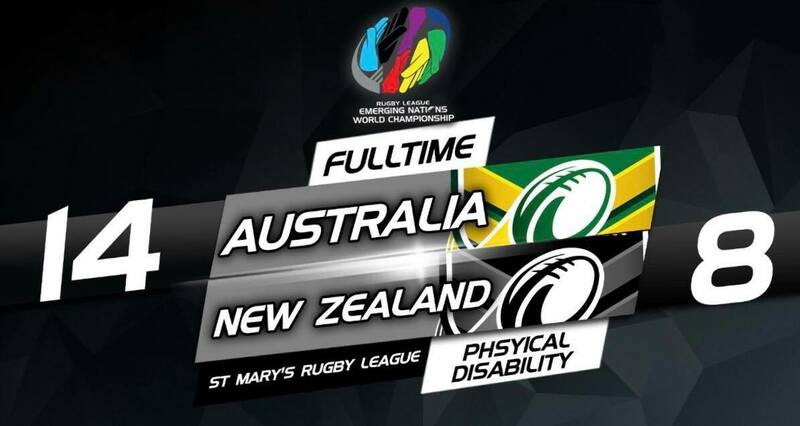 Australia go on to win the Physical Disability Championship over New Zealand in a tough game 14-8.